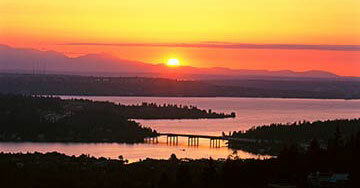 SEARCH ALL WATERFRONT: PUGET SOUND, LAKEFRONT, RIVERFRONT & MORE! Whether you are searching for Puget Sound waterfront homes, a beach home, or beachfront property in Washington State, WashingtonWaterfronts.com has you covered. Featuring all lakefront, riverfront, oceanfront, and other waterfront homes in Washington State, the variety of waterfront properties for sale covering Washington State's 3000+ miles of shoreline will leave you dreaming of living along one of Washington's spectacular waterfronts. If you're seeking coastal real estate along Washington's Pacific coast, you've come to the right place. 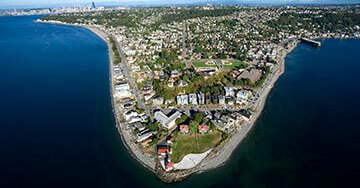 Use the guides above to navigate the variety of waterfront real estate in Washington State. On the other hand, if you're seeking lakefront property, Washington State's many lakes will not disappoint. 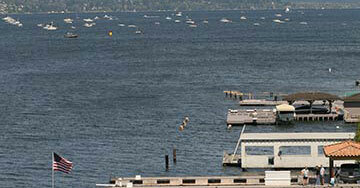 We recommend checking out the lakefront homes for sale along the shores of Lake Washington and Lake Union to start. We empathize completely with the strong emotion that visiting one of Washington State's waterfront communities, big or small, manifests. If you're just starting the search for your dream Washington waterfront property, we encourage you to visit as many of Washington's waterfront neighborhoods to see which community feels right to you. Be sure to browse our waterfront lodging, waterfront restaurants, and waterfront things to do listings to research and plan your house hunting excursion to Washington State. Use our state-of-the-art property search, including an interactive map search, to find waterfront homes for sale in Washington State. These listings are updated daily from the MLS. Or, use our Waterfront Real Estate Guide to browse Washington State waterfront listings. Our waterfront guide will keep you up to date with the latest waterfront properties in Washington State. And, for your convenience, be sure to register for a free account to receive email notifications whenever new waterfront homes for sale come on the market that match your specific criteria, and save your favorites for quick and easy access whenever you need — it's fast, easy, automatic and FREE! With a Property Tracker account, you'll be among the first to know about the newest waterfront homes for sale in Washington State.